The selection of the TIME Person of the Year always marks an interesting cultural moment. In my 2006 summary of the year in digital rhetoric I opened my annual video with the TIME cover with the mirrored page that announced that the person of the year was "You." The subtitle explained that Web 2.0 was to be a new era of second-person culture: "Yes, you. You control the Information Age. Welcome to your world." 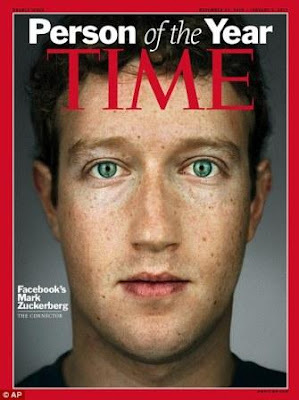 This year the TIME cover offers not a reflection of the reader's face but a youthful blue-eyed visage with freckles, stubble, with shine under his eyes. The 2006 cover made some sense in light of the 2006 elections in which social media shaped results in both the House and the Senate. In 2010 the only newsworthy event tied to Facebook founder Mark Zuckerberg is the debut of the film The Social Network. One might argue that this is really a story about cinema not the World Wide Web, as a particular film gears up for the Oscar race. is devoted to differences between fact and fiction in relationship to the David Fincher film. Apparently Zuckerberg is warm and well-liked, didn't have to struggle to get the girl of his dreams, and never drank appletinis. In the 1970s the communes faded away, but the Internet only grew, and that countercultural attitude lingered. The presiding myth of the Internet through the 1980s and 1990s was that when you went online, you could shed your earthly baggage and be whoever you wanted. Your age, your gender, your race, your job, your marriage, where you lived, where you went to school — all that fell away. In effect, the social experiments of the 1960s were restaged online. Log on, tune in, drop out. It grew because it gave people something they wanted. All that stuff that the Internet enabled you to leave behind, all the trappings of ordinary bourgeois existence — your job, your family, your background? On Facebook, you take it with you. It's who you are. Zuckerberg has retrofitted the Internet's idealistic 1960s-era infrastructure with a more pragmatic millennial sensibility. Anonymity may allow people to reveal their true selves, but maybe our true selves aren't our best selves. Facebook makes cyberspace more like the real world: dull but civilized. The masked-ball period of the Internet is ending. Where people led double lives, real and virtual, now they lead single ones again. The fact that people yearned not to be liberated from their daily lives but to be more deeply embedded in them is an extraordinary insight, as basic and era-defining in its way as Jobs' realization that people prefer a graphical desktop to a command line or pretty computers to boring beige ones. Here Grossman tells a familiar story about the relationship of the Internet to counter-culture, one considerably less complex than the one told by Manuel Castells that involves "the techno-meritocratic culture," "the hacker culture," "the virtual communitarian culture," and "the entrepreneurial culture" and the sometimes volatile “intersection of big science, military research, and libertarian culture" and its amalgams of identity positions. Grossman's narrative about the potential twin threats to privacy and the public good posed by Facebook also lacks the deep thinking of Siva Vaidhyanathan's The Googlization of Everything about the social web and its corporate ideology. Finally, the assertion that Facebook is a juggernaut headed for global dominance ignores the phenomenon of individual national social networks and fragmented social and linguistic spaces that Geert Lovink has described. Grossman offers a diverting account of Zuckerberg the polymath empath but his assertion that Zuckerberg is reshaping the architecture of the Internet just isn't true. Particularly at a time when a number of policy issues are at stake that require forms of civic education and collective deliberation about the social web, we don't need more great-man histories. Instead, understanding complex issues like IP address shortages, threats to network neutrality, the new domestic spaces of ubiquitous computing, and our place as humans in the Internet of things will take more than a hagiography for TIME's Person of the Year in 2010.